Bankruptcy asset sales of used fire extinguishers. Make your bid! Are you looking for a low-cost fire extinguisher? Make your offer for fire extinguisher auctions! You will discover that you can purchase the best high-quality fire extinguisher equipment, while saving a great amount, all simply by attending the online auctions on Industrial Discount. We are specialized in the sale of items belonging to bankruptcy procedures and company liquidations, which we handle in a very attentive way, so that we are able to guarantee the lowest prices on the market, and the best quality of the used machinery. To be able to meet the needs of any kind of company, we have structured our online auctions in two stages: the first stage allows you to bid on a single item, while the second one, which lasts about 10 minutes, allows to bid on the whole asset of items. If no offer is made during the second phase, the winners of the first one are confirmed and can purchase the items. Don't wait any further: register for free and find the lot that is best for you! You can search our catalogue by filtering your results or by reading the technical specifications each item is equipped with, as well as viewing the high-quality photos included on each auction page. If you need any further information, you can contact us by chat or call the auction agent to make an appointment for an item inspection before making your offer. Find the best used fire extinguisher equipment for your needs! All our items are fire extinguisher disposals, tested and ready for use. 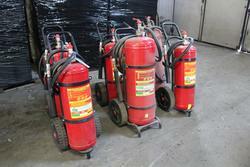 Don't miss the best deals on used fire extinguishers, make your bid now! Do you want to stay updated about the upcoming auctions of used fire extinguishers? Subscribe to our newsletter! You will receive a weekly email showing new items for sale.